Author: Hart, Darryl G., Muether, John R.
My third book by Darryl Hart (and John Muether) is a welcome breath of fresh air regarding worship and at the same time an exercise in discernment. 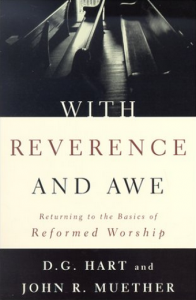 Hart and Muether are defending Reformed/Presbyterian worship and so include and defend many things in their church services which I would not (sacraments, liturgy, Sunday Sabbath, etc.). However, in many ways I feel a “co-belligerent” (to use Francis Schaeffer’s term) with these conservative brethren who also see their churches becoming worldly and irreverent. The main thrust of the book may be the proposition that worship must follow a specifically Biblical pattern (the “regulative” principle), i.e., “I will do only what is Biblical” as opposed to following the human artistic ability pattern (the “normative” principle), i.e., “I will do anything that is not unbiblical.” In addition, Hart and Muether stress that the church is not designed to be a place of entertainment or even necessarily pleasing to the attender (especially the unbeliever). It is designed specifically by God for the nurture and growth of His children and, therefore, can and will become challenging, hard, and even boring. But the design (in the regulative principle) is by God and not by man. We understand this when it comes to child-rearing, coaching, and mentoring. Why can’t we see this when it comes to spiritual growth as well, especially when it involves the Scripture and God’s church? My primary critique of the book would be with my Baptist objections to their Presbyterian doctrine, specifically the appeal to “the sacraments,” the “means of grace,” the “spiritual presence of Christ” in the sacraments, and various liturgical formats. But the fact is that sometimes we can admire someone’s house even though we don’t like the entire foundation. There are Baptist brethren’s houses I can’t live in even though I like the foundation.